The arctic sea ice has been shrinking as a result of climate change. 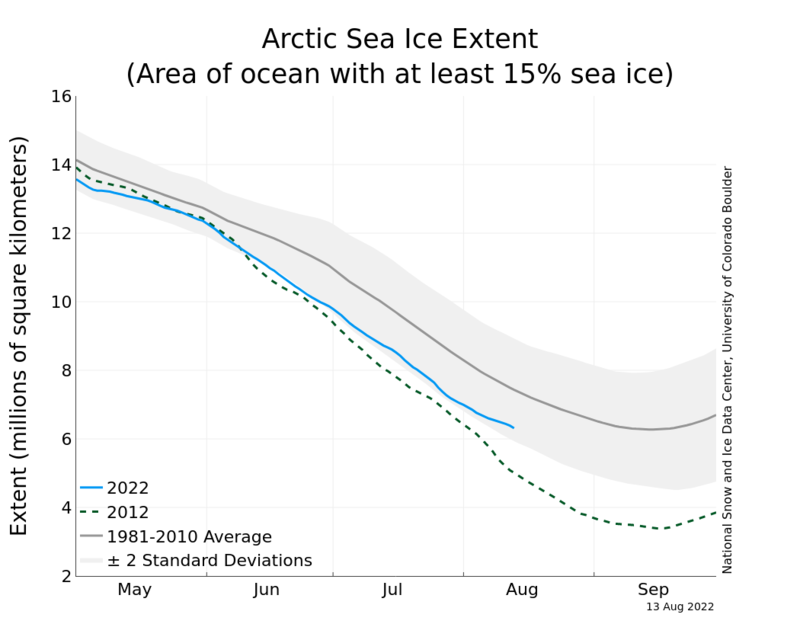 A key measure is the annual minimum artic sea ice extent, which occurs typically around mid-September each year. The authoritative source for this information is the National Snow and Ice Data Center (NSIDC) at the University of Colorado. In 2012, the minimum artic sea ice cover reached an historic low at 3.369 million square kilometers, less than half of the 1980-89 average. The purpose of this market is to help predict the minimum artic sea ice extent, which in turn helps inform policy makers and the public, and stimulate research to improve models of arctic sea ice variation in response to climate change. By rewarding the best forecast financially, this prediction market provides a financial incentive to improve forecasting ability. The table on the right shows the measured minimum sea ice extent for every year since 1980, expressed in million of square kilometers. The two other columns in the table indicate the percentage change relative to the last year, and relative to the 1980-1989 average minimum sea ice extent. 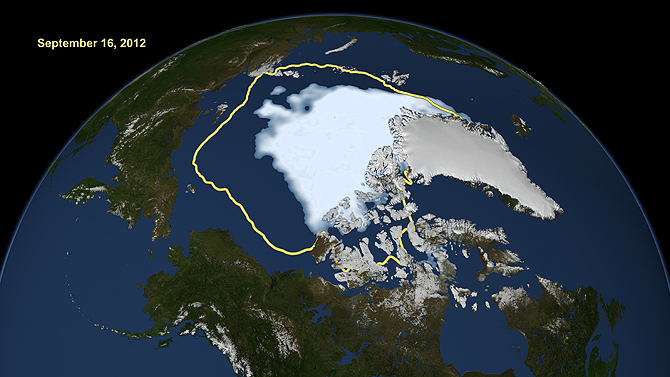 For example, in 2012, the minimum sea ice extent of 3.369 million square kilometers was the lowest on record. It was 21.7% smaller than in 2011, and 51.6 smaller than the average 1980-1989 extent. There are two contracts traded in the Minimum Arctic Sea Ice Extent Market: a high extent contract ("HGH") and a low extent contract ("LOW"). These two contracts mirror each other in this linear threshold prediction market. A linear threshold prediction market is characterized by an upper and lower threshold and an intermediate range. Concretely, if the minimum arctic sea ice extent exceeds the upper threshold, contract "HGH" pays $1 and contract "LOW" pays $0. If the minimum arctic sea ice extent drops below the lower threshold, contract "LOW" pays $1 and contract "HGH" pays $0. 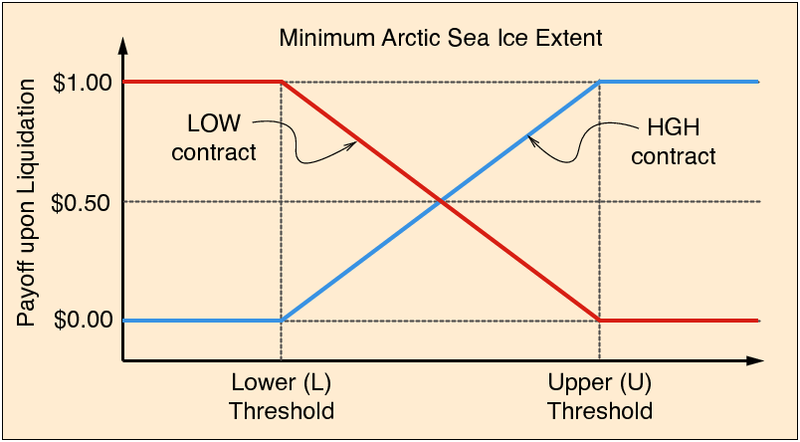 If the minimum arctic sea ice extent falls into the intermediate range between the lower (L) and upper (U) threshold, the contract payoff is determined by a linear function. In this case, if X is the actual minimum arctic sea ice extent and U>L, contract "HGH" pays $(X-L)/(U-L), and contract "LOW" pays $(U-X)/(U-L).